I was in the Santa Clarita area of Southern California for a couple of days of peakbagging before joining the family in Irvine for a volleyball tournament. Patrick was driving up from Dana Point to join me, but traffic would conspire to push his arrival past our 8a meeting plan. Luckily he was able to text me well ahead and I had time to tag an extra summit while he sat in traffic. Poor Patrick. Our outing in the Magic Mountain Wilderness would start from Soledad Canyon, with plans to tag both the Wilderness Highpoint and Prominence Point. The highpoint is reached fairly easily, but the prominence point has recorded only a single party visiting it, reported to be a tough bushwhack. I had come prepared with clippers to groom a trail from one peak to the other, but luck was on our side today. The Sand Fire from July 2016 had swept across almost the entire wilderness which is located on the northwest side of the San Gabriel Mountains. The fire had been unusually thorough, leaving very little standing in its wake. Consequently, the clippers would go unused and cross-country travel on almost all the slopes, ridges and ravines was completely brush-free. This allowed us to reach another minor summit in the area that was last reached 13yrs earlier (undoubtedly after the previous fire cycle). All in all, a great day that we both enjoyed a good deal. I had slept the night at the TH for the Golden Valley OSP off Placerita Canyon Rd. 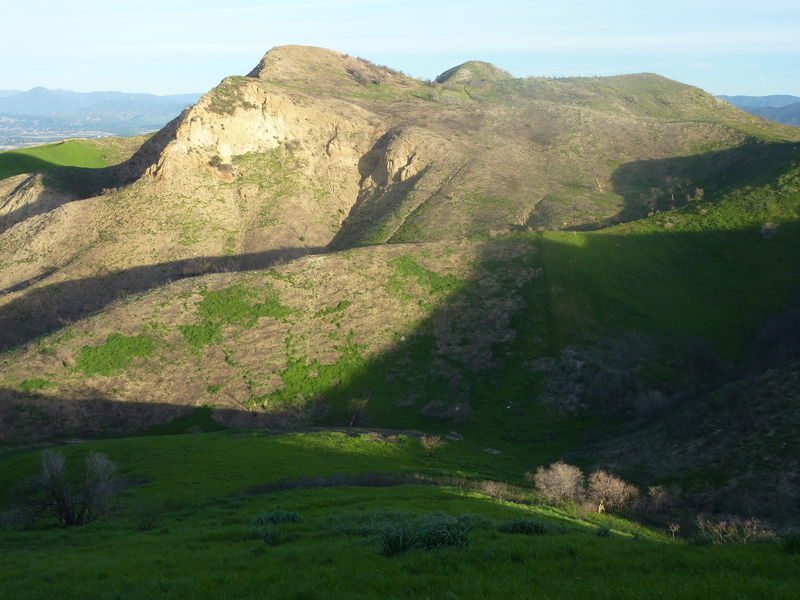 Horse BM is the highpoint of the OSP, a collection of low hills situated between the Santa Clara River to the north and Placerita Canyon to the south. A series of old ranch roads serving as trails lead to the summit in a mile and a half. The area had burned over in the same fire the previous summer, but here the recovery is well under way. Most of the brush had been burned off, leaving the slopes covered in a verdant blanket of new grass that looked more like something in Marin County than LA County. Starting just before sunrise, I spent and hour covering the eastern half of the OSP in a circular route going over Horse BM along the way. It was from Horse BM looking south that I first suspected our outing to the Magic Mountain Wilderness would be much easier than expected. The slopes there looked exceedingly bare, but I wondered if the dead brush branches would create their own set of problems. With more time to burn due to Patrick's traffic delays, I drove about 20min to the northeast to the corner of Soledad Canyon and Agua Dulce Canyon Roads. Leaving the van here where it would be easy to spot by Patrick if he drove by before my return, I started cross-country up steep slopes to Agua Dulce BM, 2/3mi distance, climbing 900ft in the process. Here, too, the slopes were open and covered in green, but they don't appear to have been burned over in the Sand Fire. The brush was very modest and no obstacle at all climbing up one ridge on the southeast side and descending another to the north and east. The two mile effort took just under an hour. I drove east on Soledad Canyon Rd to the Indian Canyon PCT Trailhead found just up the road. Patrick showed up about 9a, maybe 15min after I arrived. We worked out logistics and then repositioned the vehicles about 3/4mi to the west along Soledad Canyon Rd. We did not plan to use the usual route up the PCT or Indian Canyon Motorway, but instead take advantage of a more direct ridgeline to the west that showed a use trail on the satellite view. There is a juvenile detention center just east of this ridge and it appears that the detainees have created a network of trails in the area, including along the ridge we ascended heading south. Trail or no trail, the ridge proved brush-free and very little burned branches to dodge. There are a few trail signs that can be found in the first mile along with a memorial cross for someone who had passed in 2008. We went over a pointed listed on PB as "The Moon", appropriately so for the post-fire scene, though the name pre-dated the most recent fire. Just before the two mile mark, we made a detour and left the ridgeline to visit another PB summit in Pt. 3,130ft a short distance to the east at Patrick's behest. From there we continued southwest to Pt. 3,665ft, another PB summit and the junction point between the Wilderness HP (above us to the southeast) and the PP (down to a saddle and then up to the northwest). It was just before noon when we reached the Wilderness HP, having taken 2.5hrs. There was a small, single-page register left by Keith Christensen in 2013. There were other entries by Craig Barlow, Paul Garry and Bob Sumner, all among the usual suspects. Our highpoint at 4,700ft was less than half a mile off the crest of the San Gabriel Mtns to the south. Magic Mtn rose a few hundred feet higher about 2.5mi WSW, with the much higher MT. Gleason about 7mi ESE. Following a stop of sufficient length to allow Patrick to top off his fuel tank, we turned back, heading to Pt. 3,665ft and on to the Wilderness PP. We covered the 1.7mi wth a 750-foot drop through a saddle in about an hour, arriving not long after 1p. There was no register here, though this didn't really come as a surprise. I've not found anyone outside myself yet interested in Wilderness Prominence Points, so to most this was just unnamed Peak 4,054ft, normally a brushy undertaking. We were doing so well on time that it was easy to convince Patrick to continue northwest to unnamed Peak 3,897ft, another mile further. The saddle between the two was easier than the last, but still more than 450ft. We were surprised to see a cairn here, and more surprised yet to find a register in a nested set of cans. No one had yet recorded an ascent on PB or LoJ, so we wondered who might have left it back in 2003. His name is Bill Johnson, a fairly common name but not one we'd heard of in peakbagging circles. A few other parties visited the summit in 2004, then silence. We suspect that the register had been placed after a previous fire, with the brush then growing back and making a visit almost impossible. We headed northeast off the summit, following a ridgeline down to a small creek channel, the last half mile back to Soledad Canyon following this creek. With something over a mile to walk back along Soledad Canyon Rd, we stopped at the rustic Rio Market for some soda before returning to where we'd started around 3:45p. It seemed a little early to quit for the day, so we drove back to Agua Dulce Canyon for a last hike to unnamed Peak 2,844ft on the opposite side of the canyon from Agua Dulce BM. Lower and easier than Agua Dulce BM, we spent an hour on a cross-country route up one ridgeline and down another, once again on the green grassy slopes that make for a more scenic hike. The summit has a good vantage from which to view Three Sisters Rock which we planned to visit the next day. It's a striking sandstone/conglomerate feature that I'd first seen a year earlier when I was in the area. It looked quite difficult from our viewspot, but we hoped a close-up view would tell a better story.